"A Day in the Life" is one of the the greatest songs ever written. It brilliantly blends together two different Lennon and McCartney tunes and ends Sgt. Pepper's Lonely Hearts Club Band. I just recently purchased the 50th Anniversary Edition on vinyl. It was remixed from the original tapes by George Martin's son, Giles. This, perhaps, is the way Sgt. Pepper's was meant to be heard. 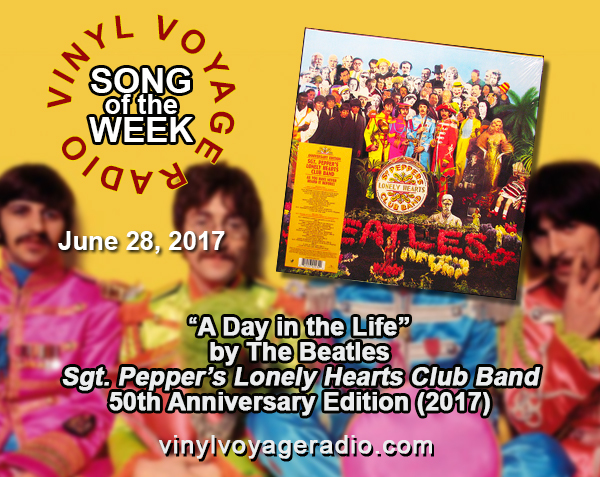 You can hear this track on Vinyl Voyage Radio on Wednesday, June 28, 2017 at 10--am and pm, central time. Or, if you can't wait, listen to it below as it plays on the turntable. Grab some headphones. It'll be worth it.